Across America, the people of God strive to bring lost people the good news of Jesus Christ. As part of the Great Commission, this is commendable. But our attempts are often misguided as we inadvertently displace the Lord as the center of life in our drive to attract non-believers. Christ-centered preaching has been abandoned for magic formulas promising to deliver our best life now. Ordinary means of grace, like prayer and sacrament, are ignored in favor of marketing to specific audiences. Worship worthy of our majestic Creator is regularly exchanged for mere entertainment. In short, God’s glory has been eclipsed. 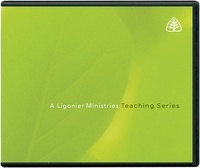 In this series of lectures from Ligonier Ministries’ 2006 Pastors Conference, Drs. R.C. Sproul, Ligon Duncan, and Steven Lawson strive to encourage and exhort pastors to keep God at the center of worship, preaching, music, prayer, evangelism, and ministry.